My newest French art binding creation. For more info and pics and video presentation, Please see the Bookbinding section. The Metropolitan Museum of Art NYC (The Met Library) Instagram postings about my marbling art in their permanent collections !!! Classic design with a contemporary flair. I incorporated some of my special techniques on this binding - sparkling edge, Faux Ivoire panels, marbled paper and white leather relief panels. 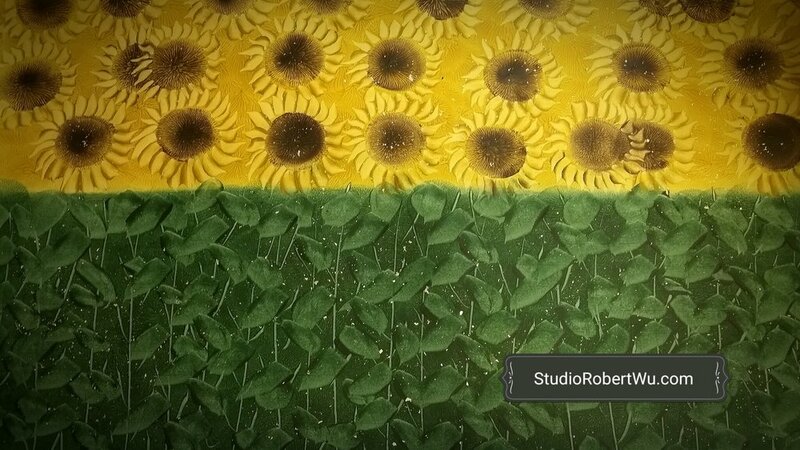 For more pics & info, please vist www.studioRobertWu.com under bookbinding section. 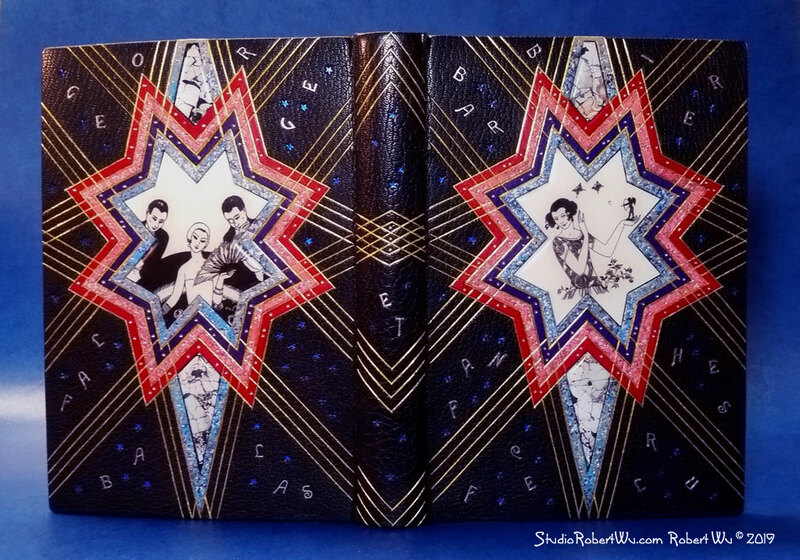 Please check out my new binding - Vignette from a bygone era under my bookbinding page for pictures and video link! My newest commissioned Arctic binding was just finished. The project started two years ago and I had to wash the entire 300 pages of this 18th century book as the pages were dirty and moldy. It took me more than two months just to wash, flatten and conserve all the pages before the binding could commence. The binding is bound in the full French technique that I was trained in. The French Reliure d'art technique is considered the most refined and beautiful bookbinding technique. I was happy with the way the design turned out. I was also trying out my new decorative panel technique I called "Faux Ammolite" to emulate the northern lights effect. I hope I have achieved it if you see it in person and panel animates and sparkles with colours under light. The egg shell panel turned out beautifully too. They all fit like a puzzle. Interior flyleaves are lined with my own special marbled paper. Shakespeare's King Lear printed at Roycroft shop 1904. Full leather design binding by Robert Wu. Bound in full green leather with simple blind tooling and titling in 22k gold leaves. Inset " Faux Ivoire " panel created by me and framed with leather strips. Interior marbled paper by Robert Wu. Housed in a linen covered folding box. Book dimension. 8 1/2" × 10 1/2"
I am very happy with the way the design came out for this binding. One of the requirements from the commissioner was to incorporate white feathers and British flag in the design. The book is bound in full French technique with gorgeous navy blue leather. The design utilizes traditional gilding in 22k gold, palladium, and various coloured leather onlays and eggshell panels I made. Inside covers are lined with beautiful Abalone panels framed by leather strips and flyleaves lined with cork gold paper. Like all of my bindings, I incorporate with my own marbled paper in turquoise. The top edge of the book is coloured in navy blue with my own special "glittered edge" effect. The standing board edges and headcaps are gilded in gold leaves as well for that extra tour-de-force details. The titling is done with this beautiful Art Nouveau Typeface with palladium and 22k gold. The whole book is housed in linen covered folding box lined with red suede. Here is a youtube video presentation of the binding. George Babier's masterfully illustrated book "Fetes Galantes" was published in 1928 in Paris. It contains over twenty exquisite pochoir plates. The book is in large quarto format measuring 9" x 12" without the binding. I started this binding 3 years ago and have been working on it intermittently. It's my favorite and most lavish binding to date. This book is copy #974. The open covers measure 20" x 12". It's been a long journey since I started working on this binding of my own. I have huge admiration for George Barbier's illustrated books/drawings. So much thoughts, cost and labour and skills have gone into making this sumptuous binding. When I first saw the pochoirs in the book, a vision came to me. An image of the women with a fan in front of her face peeking through. It's a gift from above that I must fulfill and realize without changing a thing. Pictures are worth a thousand word. Here is a youtube video presentation of the binding. An unique creation by Robert Wu. I discovered a new method to marble this unique floral effect through countless experiments. Theses floral papers are available for sale. Email me for wholesale / quantity pricing. Natalie Goldberg's " Into This World ". Woodblock illustrations by Clare Dunne. Printed by Sialia Rieke, copy # 37 / 50, 2011. This beautiful spiritual book is bound in full yellow chagrin leather in French technique. Decorated with various coloured/textured leather onlays. Tooling in foil and 18k gold. Handsewn silk headbands in brown, yellow and green. Inside marbled endpaper by the binder as well. Cork gold flyleaves. Housed in a pull apart solander case in Danish millimeter style, covered with German linen and edged with grey leather. The book measures 8" x 5 1/2" close. 30 selections of my Marbled Graphics in The Metropolitan Museum of Art in NYC! 30 selections of my Marbled Graphics are ready to go into the permanent collection at The Metropolitan Museum of Art in New York City! I am feeling very happy. Wanderings of an Artist by Paul Kane. Designed and bound by Robert Wu for The Royal Ontario Museum, Canada.
" La Tete Or " by Morina Mongin. Designed and bound by Robert Wu, Toronto 2017. This binding is made for an upcoming exhibition at Laure and Éric Busser's bookstore in the Latin Quarter in Paris from March 21th to 31th, and then at their booth at the Salon du Livre Rare au Grand Palais from 5 to 9 April 2017. Morina Mongin is a Paris based fine binder who wrote this little poetry book about us the bookbinders/gilders...She is the creator of La Reliure Contemporaine and invited a small group of fine binders working in the great French tradition to bind this little book for the salon. My inspirations for this binding are Japonisme and Chinoiserie - when the East (my heritage) meets the West. Stylistically, it's naturally fitting for me and very appropriate for this occasion as it is the first showing of my binding in Paris, France. I am thrilled to be part of it and was told that the show will be featured also in the French book magazine Art et Metiers du Livre! The book measures 5" x 5" x 1/2" thick. It is bound in the French simplified style. The spine is covered with red goatskin and titled in gold. The headbands are made with yellow calfskin. The cover boards are covered in white goatskin with onlays of various decorative coloured leather. The inlaid eggshell panels are made by me as well and added with sunago (gold flecks). Inside marbled papers in red are hand marbled by me. The top edge is coloured in red and gauffered in gold. I decided to make a Chinese/Japanese style folding box with bone clasps. I love this type of traditional Chinese folding box because it reminds me of layering quality of kimonos and origami. It's covered with gorgeous Japanese silk/rayon fabric and lined with cork and gold flecked Japanese monigami paper. The overall folding box measures 5 1/2" x 5 1/2" x 1" thick. I am very happy with the way everything turned out. The designs were executed and composed right on the covers without using any template for this binding to keep the spontaneity and improvisation alive! It's more fun that way and I hope I have achieved design of timeless quality. Simon Bussy's Bestiaire, 1927, Paris, large quarto size with 15 pochoirs. Designed and bound by Robert Wu, 2017. Green goatskin with gilding in 22k gold and various colour leather onlays. Top edge coloured in green with gauffering. Inside doublures of suede and cork paper. Handsewn silk headbands. Marbled flyleaves in green by Robert Wu. Housed in chemise and slipcase covered with my own marbled paper as well. Inside lined with blue suede. Extra linen box to house everything. 24×14" open cover dimensions. A sumptuous French binding. I started this project three years ago. Painstakingly, I finally finished it. Studio Robert Wu interview in Toronto Star Newspaper ! What a perk! Story interview about my marbling art in today's Toronto Star newspaper!